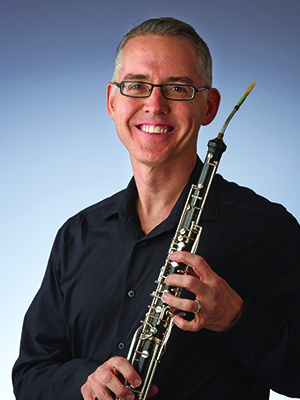 Active as a performer in chamber, recital and orchestral settings, Roger Roe has served as English Horn and Assistant Principal Oboe of the Indianapolis Symphony Orchestra for 21 years. He also enjoys a vibrant teaching career at Indiana University’s Jacobs School of Music, where his many students have gone on to jobs in major orchestras and other ensembles, as well as careers in many other fields. Roger has appeared as soloist with the ISO and other orchestras on oboe, oboe d’amore, and English horn, as well as narrator and creative director for children’s concerts. He has appeared in recent years in chamber music concerts, master classes and recitals around the United States and the world. Roger champions new music for oboe and English horn, having premiered several new pieces and commissioned new works. He is also interested in theatricality and improvisation in music and other arts, as well as the intersection of music and spirituality, enjoying recent collaborations with ministers, rabbis, dancers, actors, singers, poets and others on various liturgical and scholarly projects. Roger’s most recent recording is a collection of trios for oboe, viola and piano, entitled Wordless Verses, released on the Naxos label in 2016. He is a native Texan and graduate of Arts Magnet High School, Southern Methodist University, and the Cleveland Institute of Music. His major teachers included Eric Barr and the legendary John Mack. "In addition to the oboe, I also enjoy playing the piano and listening to the human voice. Studying the human voice, particularly soprano singers, is a great exercise which I use when teaching classes. After all, it is the human voice we, as the orchestra, are trying to capture and imitate."